Turn your paper into digital information that you can use. Visioneer offers multi-tiered scanning services and solutions for projects of any size. Why spend thousands of dollars storing paper documents when it's not the paper you want to keep; it's the information on the paper that is valuable. Let our experts teach you how to turn your paper into digital information that you can use. Today's business practices can be improved by eliminating paper-based processes and implementing more efficient document imaging workflows. Document imaging begins with the conversion of paper documents into a digital format that can be searched, shared and organized. 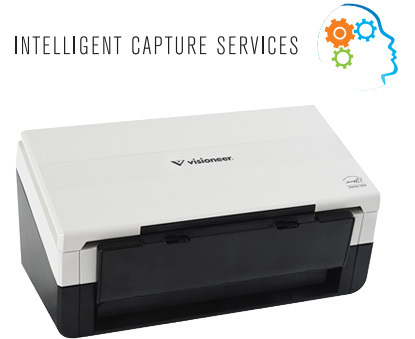 Document scanners are business tools that can help save time and money, preserve natural resources, secure vital information from disaster and even create office space. The first step to managing paper more efficiently is investing in a document scanner. The next step is learning how to use it to maximize the return on your investment. Taking the time to have your in-house staff trained on properly installing and configuring your DocuMate scanners will reduce ramp-up time and overall labor costs. It will also increase the success of future project implementations and help your team meet project deadlines. Our Intelligent Capture Services will allow your company to maintain the highest security standards—your standards. Document transportation logistics and extra expenses will be avoided by completing document imaging at your own facility. All costs are presented up front and known. Services are delivered by factory-trained technicians who work with government agencies, educational institutions, medical, healthcare, and insurance companies, as well as businesses of all sizes. Find more information on our datasheet or Contact Us. Provide instruction on installing and configuring your scanners and their powerful software bundle. Demonstrate how to capture specific information from documents. Create a strategy for an ongoing document imaging workflow. Train your in-house staff to be document management experts.